The Jaguar F-Type is the car Steve McQueen would drive if he were still gracing the earth with his badass-ness. What do you need to know before you buy a Jaguar F-Type? Don’t worry, we’ll tell you everything right here in the Ultimate Buyer’s Guide. You might not smoke a Porsche 911 through the curves in this car. The interior appointments of a Mercedes-Benz AMG GT might shine a little bit brighter. But the loud and proud F-Type has put wheels on a concept it’s hard to help but find attractive. It’s like a deep voice and a tailored suit. A pint of dark beer poured at just the right pitch and temperature. It just feels right. Someone spoiled on a regular diet of high-performance cars might not feel their brain evaporate when the tall pedal’s stomped but, realistically, just climbing into the cockpit of any F-Type from your mid-sized sedan is going to feel pretty exciting. You’ll watch the road almost pour over you as drive across it, which feels more like “through it” from the F-Type’s super low pilot seats. The rear-wheel drive variants pull nicely through the corners, and the manual transmission (yes, there’s a manual) is compliant and rewarding to operate. Brakes are strong, but in most F-Types you’ll be more likely to gallop along than sprint. The car’s fair-but-firm handling and smooth power application lends itself to spirited but not savage driving. Unless you’re in the AWD V8, which thunders from a stop to several times most speed limits with one pedal and comes screeching to a halt with the other. We haven’t even mentioned the electronically modulated exhaust yet; which might not do anything for the car’s performance on paper but once you hit that switch on the dash you unleash a machine gun-wielding dragon with a mouth full of fireworks. Best believe you’re gonna feel plenty fast. Jaguar’s gorgeous F-Type launched as a 2014 model only as a convertible and only as an automatic. It could be had with a 340 horsepower supercharged V6, a more powerful 380 horsepower version of that same engine or a 495 horse supercharged 5.0-liter V8. Then a year later, they released the 2015 F-Type Coupe, which could be had with the 5.0-liter V8 but with power bumped to 550 stallions. Jaguar announced in 2016 that they’d make enthusiasts happy by offering a 6-speed manual and all-wheel drive on the F-Type. The manual can only be had on the base 3.0-liter base and S models, while all-wheel drive is only available for automatic-equipped F-Types. All-wheel drive F-Types get a new hood and some fresh bodywork. Also new for ‘16 is the convertible R trim. The R trim has heretofore been reserved for the coupe, but now the rag top gets in on the action. R trims come standard with all-wheel drive. This means you can have an all-wheel drive 550 horsepower convertible Jag. Oh yeah. To boost efficiency, the 2016 model comes with enthusiasts’ least favorite type of power assist: Electric power steering. 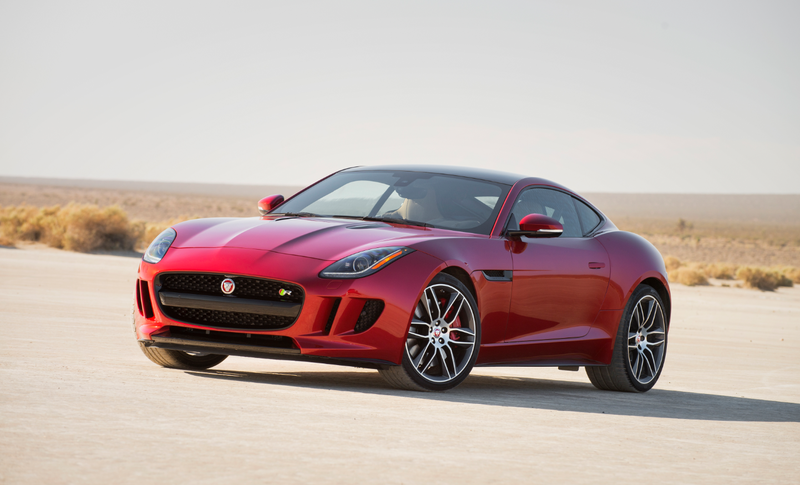 A few changes to standard equipment round out the “new for 2016” F-Type features. You’ve got plenty of options in the powertrain department. Want WRX straight-line speed but with a bit more luxury and beautiful sheet metal that belongs in an art museum? Get the base model and its 340 horsepower supercharged V6. This one can be had with either a ZF 8-speed auto or a 6-speed manual. Want a really fast car that will hang with the big guns from BMW’s M division and Mercedes’s AMG tuning house? Go for the auto-only 550 horsepower R version. That will get you to 60 in under four seconds. Are you the kind of person who likes to hedge your bets by always opts for the mid-level trim of everything you buy? The manual or auto 380 stallion S model is the ticket. No matter what you get, you’re going to be enjoying a sweet blower under that hood and an exhaust note that will make you wish you had more ears. Fuel economy is not stellar for a 3,500 pound car with 340 horsepower. You’ll do 22 combined if you get the ZF 8-speed and stay light on the skinny pedal. From there it just goes downhill. The manual loses three MPG combined, AWD loses you one MPG, and the big V8 costs you four MPG, bringing you down to 18 combined. So, not great numbers, but it’s a sports car, so fuel economy isn’t exactly its top priority. Brakes are are either 13.9-inch rotors in the front for the base model or 15-inchers in the back for the S and R models. Rear discs are 12.8-inches for the base and the S models, while the R gets 14.8-inch dinner plates. Steering is a electric and suspension is double wishbone all the way around. The 2016 Jaguar F-Type and F-Type convertible can each be had in three trim levels: base, S and R.
Base and Base Convertible: Starts at $65,000 & $68,100. Notable standard features: 3.0-liter 340 horsepower supercharged V6, 6-speed manual transmission, stop/start technology, 8-inch touchscreen display, panoramic sunroof, 12-speaker 770W surround-sound system, sport twin exhaust system, navigation, power sports seats with leather and suede inserts, 18” aluminum wheels, automatic HID xenon headlights with LED signature lights, rain-sensing wipers, single-zone automatic climate control. Notable options: Premium+Vision Pack: Dual-zone automatic climate control, power tailgate, heated seats, heated steering wheel, adaptive front lighting, automatic high beams, front and rear park sensors with reverse traffic detection, rear parking camera, blind spot monitor ($3,900); Climate Pack: heated seats and heated steering wheel ($600); Various exterior and interior appearance packages (ranging between $1000 and $4000). S and S Convertible: Starts at $77,300 & $80,400. Notable standard features over Base: 380 horsepower 3.0-liter supercharged V6, limited slip differential, high performance brakes, driver selectable exhaust, 19” alloy wheels, adaptive damping system, active exhaust system, configurable drive modes. Notable options: All-wheel drive and 8-speed automatic ($7,500); Super Performance Braking Pack: gets 14.8” rear disks instead of 12.8, red calipers, torque vectoring ($1,450); Premium+Vision Pack ($3,900); Climate Pack: heated seats and heated steering wheel ($600); Various exterior and interior appearance packages (ranging between $1000 and $4000). R and R Convertible: Starts at $103,600 & $106,450. Notable standard features over S: 550 horsepower 6.0-liter supercharged V8, all-wheel drive, super high performance braking system, electronic active differential, torque vectoring by braking, quad exhaust pipes, R suspension tune, premium leather interior, heated seats and steering wheel, 20”unique alloy wheels. Notable options: Carbon Ceramic Brake Pack-Forged Wheel: 20” forged alloy wheels, 15.7 and 15-inch front and rear carbon ceramic brake rotors, 6-piston calipers up front and 4-pistons out back ($12,000); Vision Pack: Adaptive front lighting, intelligent high beam control, front and rear park aid, reverse park camera, reverse traffic detection and blind spot monitoring ($2,100); Various exterior and interior appearance packages (ranging between $1000 and $4000). V8s are great, and so is the horsepower they bestow. But with the supercharged V6 already getting close to 400 horsepower, you shouldn’t have that much trouble talking yourself into the manual. We sure didn’t. For a car you’re going to use on spirited drives and cruises to the country, you don’t want the fastest and loudest version of you car. You want the one you’re going to enjoy most. And for a lot of enthusiasts (ourselves included) the most enjoyable cars are the ones you have to work the hardest to drive. The manual has no automatic rev-matching. It’s got a lot of pedal travel. But it snicks through gears gracefully and solidifies your image as a gentleman badass, which was why you went to the Jaguar dealership in the first place isn’t it?